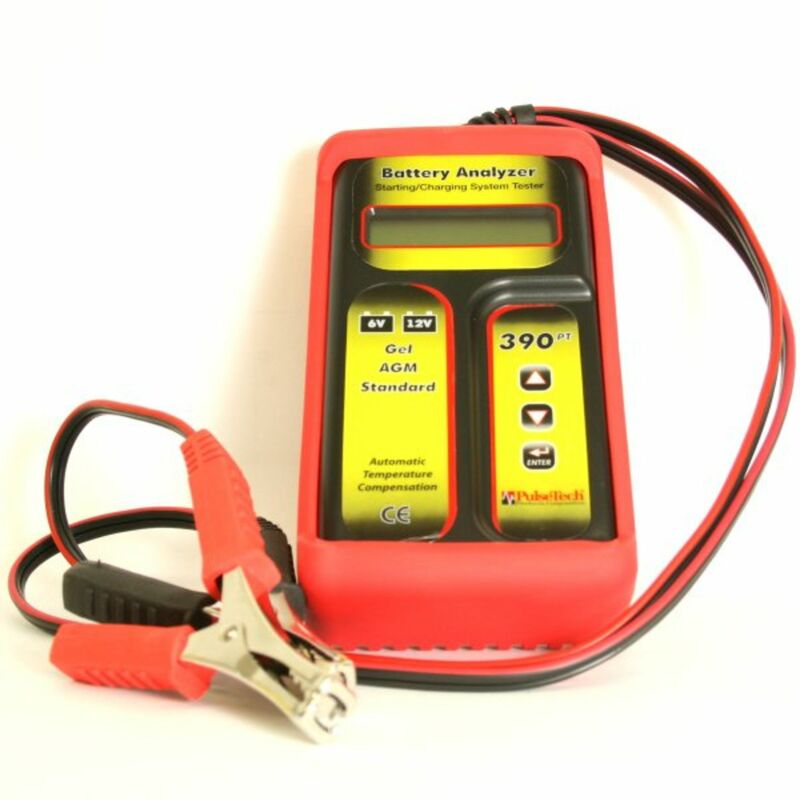 The 390PT Battery and System Tester lets you quickly, safely and accurately test both 6-Volt and 12-Volt lead-acid flooded, AGM (flat and spiral plate) and gel cell batteries in or out of the vehicle and test 12-Volt and 24-Volt charging systems for proper operation. Combined singe load, dynamic resistance technology and algorithms display battery voltage and capacity in easy to understand results in seconds. The handy "QUICK START" instruction guide is printed on the back of the tester. An absolute necessity for your battery shop or maintenance bay, the 390PT uses patented single load, dynamic resistance technology to completely analyze your battery and charging system quickly, safely and accurately. You’ll provide better battery maintenance by locating the 6-Volt and 12-Volt vehicle batteries or 12-Volt and 24-Volt starting systems that require attention while still in the vehicle. Find battery issues before they become problems. Rating System: SAE, DIN, EN, IEC, JIS Battery No. Turn off ignition, all accessories and loads. Close all car doors and trunk. Make sure battery terminals are clean. Attach black lead to negative battery terminal and red lead to positive battery terminal. Press up or down arrow indicators and press the side arrow enter key to select the battery test, battery type and battery rating. Press up or down arrow indicators and side-arrow enter key to select system test. Do you own the 741X390? Please, tell us what you think about it. It helps us provide you with better products. Please note that it may take up to 72 hours for your review to appear.